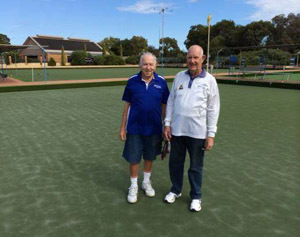 The club's coaches are a very conscientious group that are there to assist experienced bowlers whenever requested and new bowlers to get to competition standard. All coaching is voluntary and the Club gratefully appreciates their efforts. 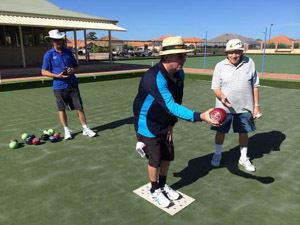 It is obvious that the initial Novice Bowler will require some preliminary instruction, but it also includes the experienced Bowler, when for no apparent reason their bowls lose their accuracy. The cause of this dilemma is often so subtle that it can escape the notice of the Bowler. A quick visit to a Coach where they can observe the Bowler's delivery, can be benificial in identifying the problem and the solution may be a simple matter that can be corrected quickly. Many Bowlers are of an advanced age and one of the tyrannies of senior years is not only losing the stamina of youth, but include athritic joints and back problems. Thee can seriously inhibit the Bowlers enjoyment of the game and unless addressed may cause the Bowler to consider quitting the game. The Club has available for Members use, approved Bowling Arms. These aids wil delete the requirement to stoop to pick up the bowl or jack and the need to bend when delivering the bowl. The advantages are enormous in the saving of energy, the almost entire deletion of pain endured during the game and of that suffered next morning. An Arm will also remove all traces of delivering a bowl that could be deemed to be causing damage to the green. The coaches will also introduce you to the requirements of looking after the greens. These greens cost in excess of $200,000 each so we must all be careful. They will also teach you the etiquette of the game. New bowler's coaching is held on Friday mornings from 9.00 am to 10.00 am. 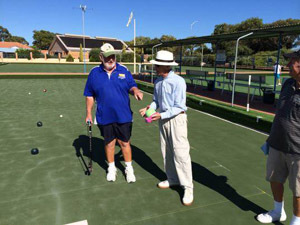 These sessions are at no charge & welcome anybody with an aim to experience the enjoyable game of lawn bowls. All we ask is you wear soft sole (non spikes) shoes & to have the will to learn. Bowls are available but as you become more experienced and hooked on the game, you will probably buy your own set of bowls. Second hand bowls are often available. A lot of people change their bowls after a few years. Not that the bowls have worn out but if our skill level goes down, we have to blame something. Kaye Sewell and Vicky Bowden. Jack Groves, Ted Bowman, Bruce Walter. The coaches will advise you when your ability is considered suitable to graduate to the initial competition level of Friday afternoon Scroungers. Once you get to this level you are on your way. Unfortunately for lack of interested players, the junior group as fallen by the wayside. If you have an interest to re-establish this group, please see the Club. It is something we would like to get back on the rails. Coaching for social groups includes the likes of a social club or work group who want to come along, have a bit of fun on the bowling green and maybe have a BBQ after or socialise in the Club. Coaches are generally available to get you started and teach a few fundamentals and of course how to look after our precious greens.